A final wrap up here on Shelved Books for 2009. And a big thank you. It's been a interesting experiment showing my design process. Thanks to all who have commented over the past year. Your feedback has been insightful and very kind. I hope to have more regular posting on my own shelved books as well as highlighting featured designers in the new Noted section beginning in 2010. Shelved Books was a long time coming. It wasn't until I saw killed work popping up on designers websites and places like design:related, that I began to think it would be appropriate to share this process. My aim here hasn't been to only show the work I think is more beautiful, because as you've seen on this site, sometimes what's been left behind was done so for a very good reason....the final was just better. You might think that on a site dedicated to rejected covers I might be against the revision process, but contrary to all evidence, I actually think that the process works well on many books. Case in point, a recent cover I consider one of my favorites to date, was the product of a revision. Not just a tweak, but a complete rethink. I had to delve deeper into the subject matter and the final design was the better for it. I would add to that, there is no substitution for a good relationship with an art director. Good feedback and help during the process is what makes the best covers as well. 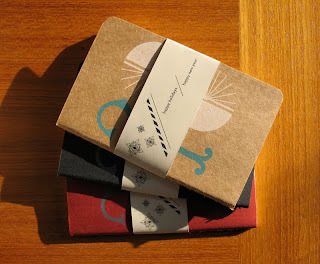 Below are pics of my recent holiday mailing. In an age where computers are a designers best friend, online community networks allow me to chat with design colleagues all over the map, and the end-of-print looms above us all...my ideas still begin in a sketchbook, and I hope it always remains that way. As book designers, we're in the unique position of working on a wide array of topics in fiction and non fiction. I've also always kept a pretty diverse client list from very, very small to large trade publishers. After all, it's the small publishers that gave me my start. About a year ago I worked on a title for CQ Press, a politics publisher in Washington, DC that publishes academic and reference books. 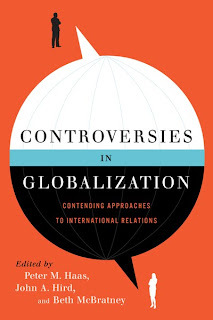 The title I did for them, Controversies in Globalization, is a textbook (not my normal fare). 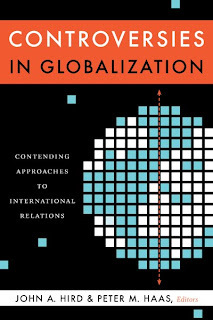 It features 15 pairs of scholars and practitioners that directly address current questions in International Relations through brief "yes" and "no" pieces. 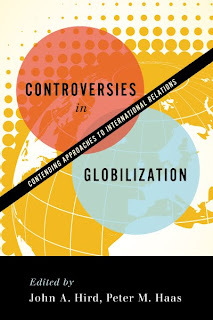 I knew that a contrast needed to be shown on the cover as this is a debate style book. The market is very different for textbooks. Mostly professors choose the books for their courses and are very familiar with competitive titles....a reason to produce a cover that is unique.